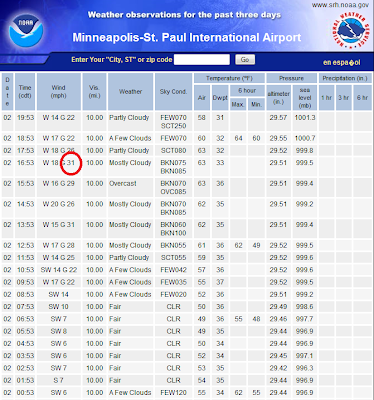 Meteorologist Paul Douglas writes about Minnesota weather daily, trying to go beyond the "highs" and "lows" of the weather story to discuss current trends and some of the how's and why's of meteorology. Rarely is our weather dull - every day is a new forecast challenge. Why is the weather doing what it's doing? Is climate change a real concern, and if so, how will my family be affected? Climate is flavoring all weather now, and I'll include links to timely stories that resonate with me. * Twitter is transforming severe storm coverage. Click this link to read how Twitter consistently had relevant, in some cases LIFE-SAVING information before the local TV stations did. Pretty amazing. Warmest March - April on Record. According to the local NWS the average temperature (averaging highs/lows) for every day in March and April was nearly 48 degrees, making it the warmest in modern-day records, since 1891. A web page with details is here. 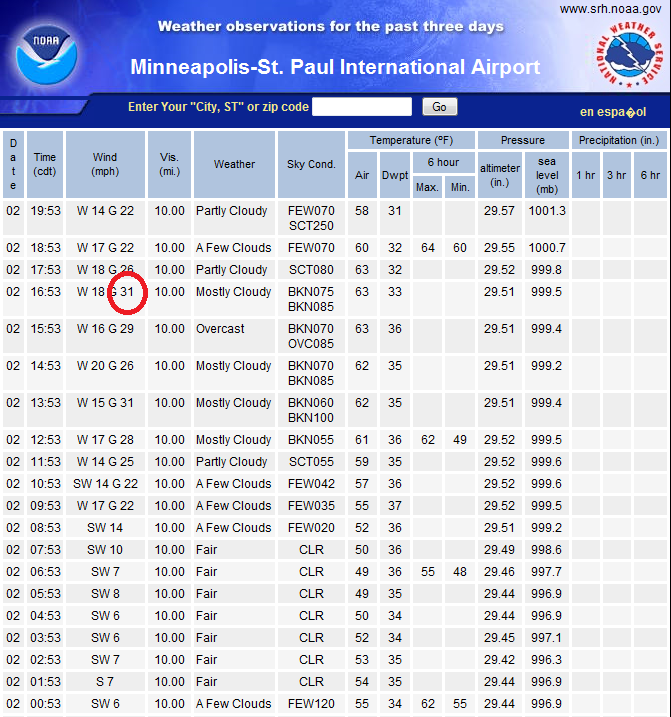 Folks up in Duluth are still buzzing about the weather, and for good reason. 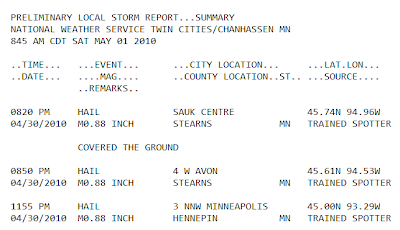 It was the warmest April on record for Duluth, 5th warmest on record for International Falls. 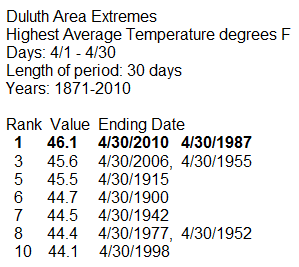 BTW, 4 of the 10 warmest Aprils in Duluth have been observed since 1987. What A Mess. 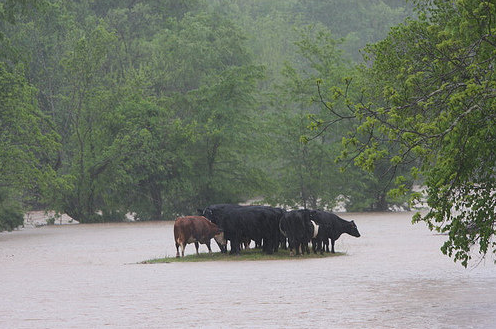 Even the cows were confused by the rising flood-waters in the Memphis area - fields have been transformed into lakes, just getting around the metro Memphis area is virtually impossible. See for yourself by clicking on a traffic map for Memphis - the entire city is gridlocked, most freeways cut off because of severe - historic flooding. A Spring's Worth of Rain. As of Sunday evening Nashville had picked up 13.46" (and it was still raining). To put this into perspective 13" is roughly a quarter of the average annual rainfall for Nashville. That building floating down the road (now a river) was a modular school, ripped from it's foundation by raging waters. 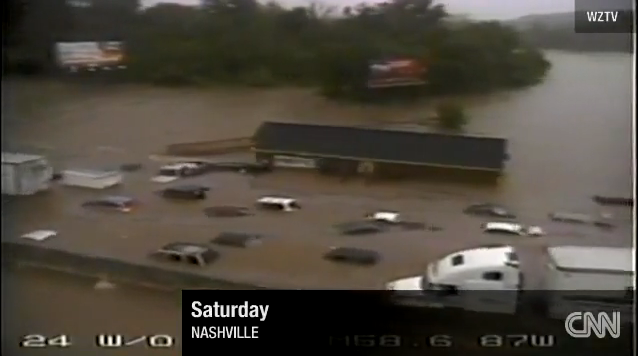 An amazing YouTube clip of the flooding is here. Gridlock. All the blue-shaded freeways are flooded/closed. Good luck trying to get around Memphis anytime soon. 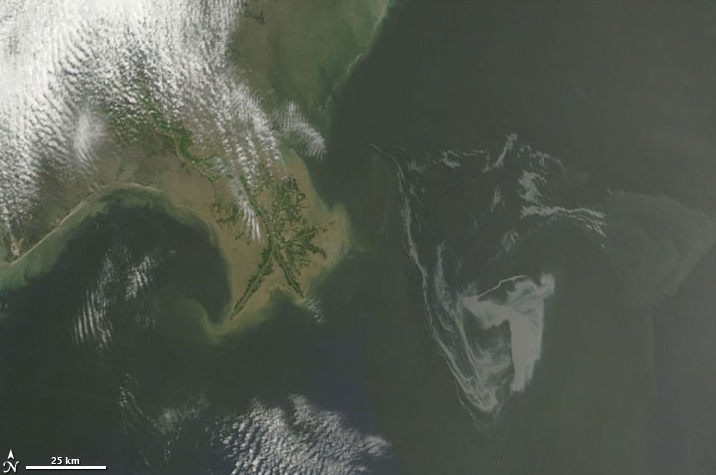 Yes, we've seen better weekends, but considering the tornadic carnage in the south, epic, almost biblical flooding in the Nashville area, and a growing stain of crude oil in the Gulf of Mexico, I'm counting my blessings, atmospheric and otherwise. Winds gusted to over 30 mph. Saturday, again Sunday, a strong pressure gradient across the state (a significant contrast in barometric pressure from south to north - a lingering storm in the upper atmosphere swirling over far northern Minnesota, where clouds and spotty PM pop-up showers were most prevalent). Sunday Almanac. Highs around the state ranged from 50 at International Falls (.18" rain) to 59 at St. Cloud, 64 at MSP and 71 in Rochester. Ah, the Memories. If you're curious about weather during the last 24 hours click over to this NOAA web page to get an hour-by-hour recap of weather for the area. Monday looks breezy (west winds gusting to 20 mph. at times) with a mix of clouds and sun, those persistent winds finally easing up by evening. Weather will be a non-issue through much of the day Tuesday, when winds swing around to the south, tugging the mercury well into the 70s - the mildest day of the week. 80 is not out of the question from Mankato to Redwood Falls. Soak up the relative warmth, because showers and a few scattered T-storms Tuesday night will mark the leading edge of a cooler front, a surge of fresh Canadian air that will have us all rummaging around in our closets for light jackets by Thursday and Friday - highs stuck in the 50s both days, about 5-10 degrees below average by the end of the week. Yesterday the models were hinting at a wave of low pressure developing along Tuesday night's cool frontal passage - hinting at a period of rain by Thursday and early Friday. The latest model run is now suggesting that the front will keep on sailing east - it probably won't stall, and that should mean intervals of sun Thursday and Friday with a cool breeze - much too cool (and dry) for anything severe this week. The weekend outlook is still a bit murky, but a weak ridge of high pressure SHOULD coax some sun out of our sky Saturday and Sunday, meaning lighter winds - the best chance of rain late Sunday and Sunday night as a storm moves in from the southwest. Keep a jacket handy, Saturday looks "brisk", highs probably holding in the 50s; right now I'd put my money on Sunday as the slightly nicer day, with highs topping 60, and morning/midday sun giving way to increasing clouds by afternoon. No soaking, drenching rains are in sight, looking out 19-15 days. The GFS model is printing out low 70s by mid May. The good news: a persistent trickle of cool, dry, comfortable air out of Canada will protect us from anything severe looking out the next 2 weeks or so - I just don't see any of the conditions necessary for a significant severe storm risk. No siren-serenade anytime soon, I'm happy to report. Friday Evening "Hailers". 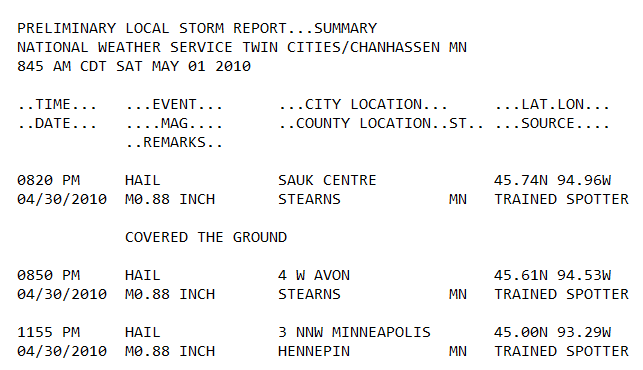 A few of the isolated T-showers that sprouted up late Friday evening produced .88" diameter hail, close to severe criteria (1" diameter, roughly quarter-size). Dirty Stain. 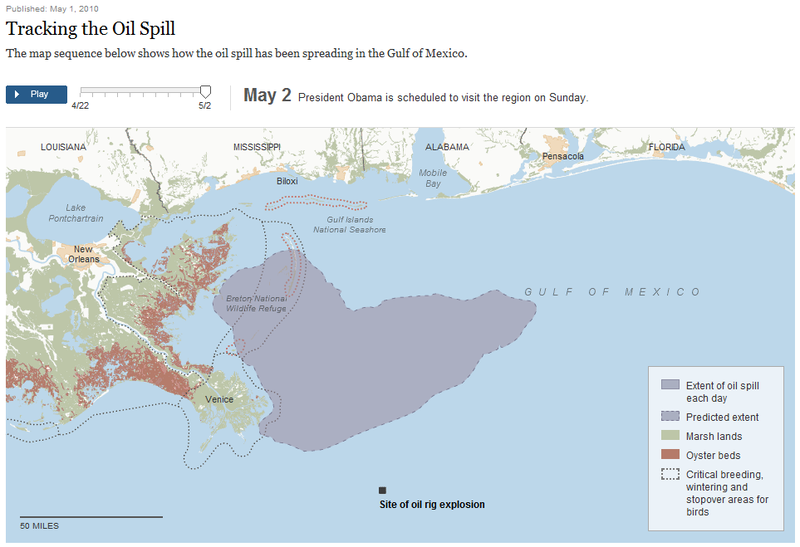 The oil spill in the Gulf of Mexico is at least 3 times bigger than it was just 3 days ago. Officials still have no idea how much oil is lurking beneath the surface, not visible from low-orbiting satellites or airplanes. 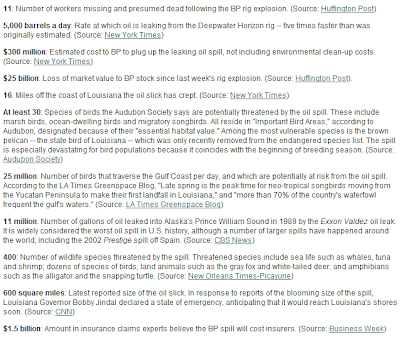 An estimated 210,000 gallons of oil/day are bubbling up from the well, located 5,000 feet below the surface of the water. Some grim numbers below courtesy of Business Week. 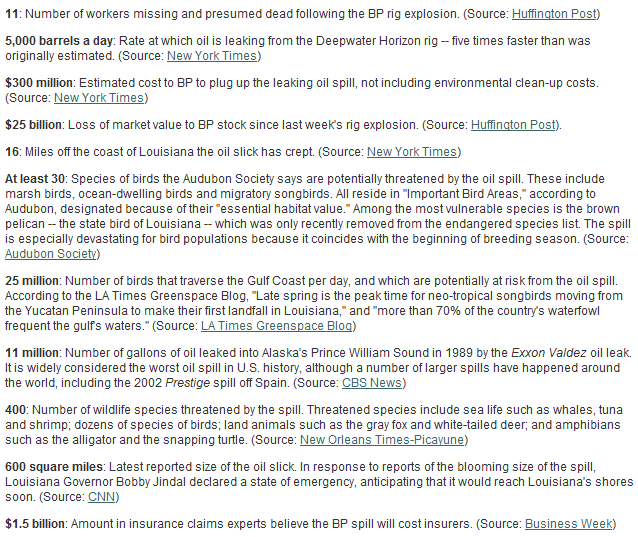 Tracking the Spill. The New York Times has an interactive map, you can see the spill growing with time, being swept ashore by prevailing winds in the Gulf of Mexico. 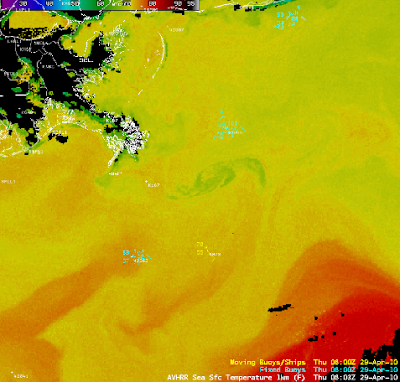 What NOBODY has mentioned yet is the following: prevailing winds are from the west - at some point all that sweet (?) crude will begin to drift to the east, towards Florida. The west coast of Florida, Tampa, St. Pete, Sarasota and the Ft. Myers area, could have oil on their beaches within 5-10 days. I don't have to tell you what the impact would be on tourism - it would be an almost unimaginable catastrophe for the Sunshine State. 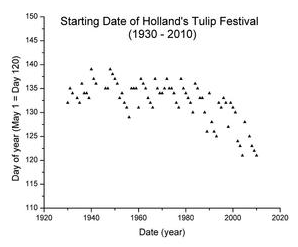 Tracking the Tulip Trends. A 3rd grade class in Holland, Michigan made a surprising discovery: tulips are blooming a full 2 weeks earlier than they were a generation ago. The trend is pretty apparent - the story here. The Bear Necessities. Nothing like a mature black bear to wake you up (in a hurry). 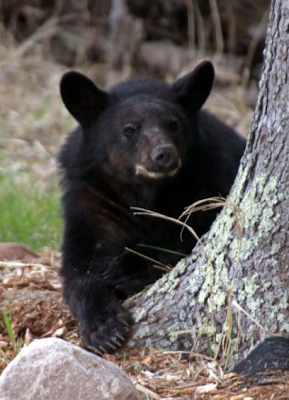 My friend up in Herbster, WI, Pete Schenck, was walking around outside when the bear approached - in fact it charged him! 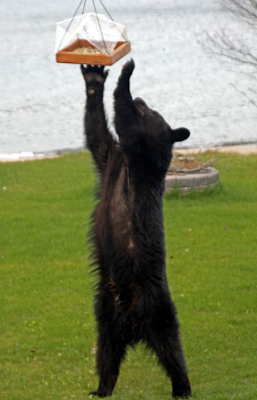 Pete started shouting at the top of his lungs, and the bear stopped, went back to foraging for food. Good call. Unbearably Cute. I know - stop already. Is he smiling, or am I just groggy?